Casella came from musical stock and was blessed with an aptitude for learning. He quickly gained a command of French and German and committed Götterdammerung to memory. He studied in the cultural ferment of Paris from 1895 to 1915. His First Symphony dates from 1906 and the next year he completed an orchestration of Balakirev's Islamey to vie with that of Liapunov. It has been issued on CD by BBC Legends as part of their Goossens collection. Works such as the Triple Concerto and the Paganinana and Scarlattiana have done modestly well. But one-time sensations such as Pagine di Guerra (1915) and the two works on this disc had sunk into the dust. The turbulent Third Symphony is a work of rampant conflict yet not of dissonance. It has some of the easy-going manner of the two Rota symphonies recently recorded on Chandos yet its tidal race of romantic conflict is more redolent of Benjamin's symphony of 1945. It is quite a discovery and was greeted as such when premiered by Frederick Stock in Chicago on 27 March 1941 and when performed in Rome three days later. One can hear something of Mahler's Fifth (the Adagietto) in the second movement. This is a work with the emotional breadth and reach of the Korngold symphony let alone the trouble-torn contemporaneous Stanley Bate Third Symphony. Its command of the heroic ground is fully laid claim to in the surging Scherzo. The passionate, sighing, louringly tension-ridden and turbulent finale is vividly put across by Francis and the Köln radio orchestra. 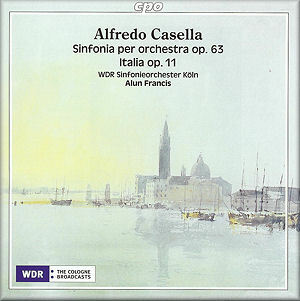 As Christoph Schlüren points out in CPO's liner-notes, Casella wrote his Italia in 1909 at the age of 26. It can be seen in the same travelogue light as Bloch's America and Helvetia but is a shade less earnest. It is said to encompass the tragic Sicily with its volcanic desolation as well as the ça ne fait rien nonchalance of Napoli. It was given its Italian premiere in Rome in 1924 but had its world premiere in Paris in 1910 at the same concert as the premiere of his Second Symphony of that year. Italia was published in Vienna by Universal on recommendation from Mahler. At the heart of Italia lies a deeply impressive shifting dream-world of hushed violins, tolling bells and a singing cor anglais. We then move from dreams to a carefree mandolin serenade which in turn gets shown the door as Denza's Funiculi Funicula bursts in with all the rampant vivacity of Respighi's Pines of Rome. When Strauss used the same tune in Aus Italien (1886) Denza successfully sued him. That tune puts in a final gallopingly confident appearance in the closing pages. It's a delightful piece overall and highly accomplished - just don't take it too seriously. It makes a good companion to Tchaikovsky's Capriccio Italien and Marx's Castelli Romani. Both these pieces are done with stunning energy and apt artistry by Francis and his Köln band. Let’s have the first two symphonies next - preferably coupled with the Pagine di Guerra. In summary then: a stirringly epic wartime symphony and the dazzling brilliance of a latter day Capriccio Italien.